Plant Food (originally known as Ramp It Up) is a microgame found in the Ninja Scribble stage in WarioWare: Touched!. Its original name is a pun on the phrase "amp it up", which means to turn up the volume or intensity. 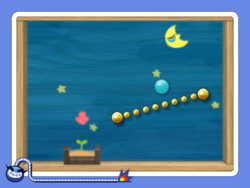 It returns in WarioWare Gold as one of Orbulon's microgames. 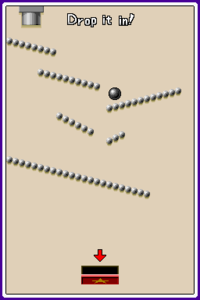 The objective of the game is to watch for the spot where the ball will fall and draw ramps to guide it to the hole at the bottom of the screen. There is a considerable amount of time to complete this microgame due to the need to carefully consider where the ramps should be drawn; only one line can be drawn at a time, and if the ball doesn't fall into the hole or if it falls into a black hole, then the player loses the game. 1st level difficulty: There are only ramps to look at above. 2nd level difficulty: There is a black hole added to the area. 3rd level difficulty: There are 2 black holes added to the area. This page was last edited on September 27, 2018, at 00:08.